Ford Motor Company announced this week the C-MAX Solar Energi Concept, a first-of-its-kind sun-powered vehicle with the potential to deliver the best of what a plug-in hybrid offers – without depending on the electric grid for fuel. Instead of powering its battery from an electrical outlet, Ford C-MAX Solar Energi Concept harnesses the power of the sun by using a special concentrator that acts like a magnifying glass, directing intense rays to solar panels on the vehicle roof. Researchers developed an off-vehicle solar concentrator that uses a special Fresnel lens to direct sunlight to the solar cells while boosting the impact of the sunlight by a factor of eight. Fresnel is a compact lens originally developed for use in lighthouses. Similar in concept to a magnifying glass, the patent-pending system tracks the sun as it moves from east to west, drawing enough power from the sun through the concentrator each day to equal a four-hour battery charge (8 kilowatts). With a full charge, Ford C-MAX Solar Energi Concept is estimated to have the same total range as a conventional C-MAX Energi of up 35 electric-only kilometers. Additionally, the vehicle still has a charge port, and can be charged by connecting to a charging station via cord and plug so that drivers retain the option to power up via the grid, if desired. The result is a concept vehicle that takes a day’s worth of sunlight to deliver the same performance as the conventional C-MAX Energi plug-in hybrid, which draws its power from the electric grid. By using renewable power, Ford C-MAX Solar Energi Concept is estimated to reduce the annual greenhouse gas emissions a typical owner would produce by four metric tons. If all light-duty vehicles in the United States were to adopt Ford C-MAX Solar Energi Concept technology, annual greenhouse gas emissions could be reduced by approximately 1 billion metric tons. C-MAX Solar Energi Concept, which is shown at the 2014 International CES in Las Vegas these days, is a collaborative project of Ford, San Jose, Calif.-based SunPower Corp. and Atlanta-based Georgia Institute of Technology. The C-MAX Solar Energi Concept debuts as Ford caps a record year of electrified vehicle sales. Ford expects to sell 85,000 hybrids, plug-in hybrids and all-electric vehicles for 2013 – the first full year its six new electrified vehicles were available in dealer showrooms. 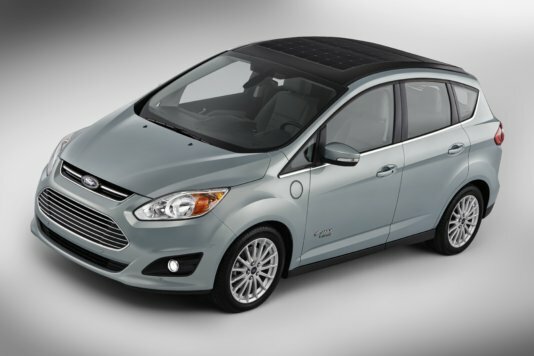 C-MAX Energi is Ford’s plug-in sales leader, with sales of more than 6,300 through November. Ford sold more plug-in vehicles in October and November than both Toyota and Tesla, and it outsold Toyota through the first 11 months of 2013. Plug-in hybrids continue to grow in sales as more customers discover the benefits of using electricity to extend their driving range.